Looks like we are in for some rain. Projection for tomorrow is 100%. Sounds pretty positive to me! Chances again on Saturday with temperatures in the upper 50s or low 60s. A brief reprieve on Sunday with low 70s and only a 20% change of rain. Monday back into the 60s and 80% chance. After Monday, it back to sunshine and 70s. Generation seems to be tapering off a little. Steady low flow this past Friday, Saturday and Sunday. Monday went back to off in the morning and early afternoon then one or two units for just a few hours. Tuesday, it came on around 3:00 p.m. and they moved some water, but we saw lower flow in the afternoon yesterday and, again, for just about four hours. Today we are supposed to have some type of generation for seven hours later today. really got ugly around 2:00 when they fired up everything. Gina had Cap and Max. They had a good day on the big ruby and a root beer midge. 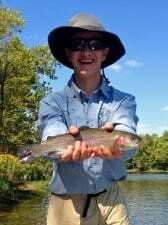 Both are good fly fishers. Darrell had Max’s father, Mark. Their best pattern was the JQ streamer. September 29, Stan Jan and Pam out for what turned out to be half a day. They had a good day on the black tunghead midge, and the holographic green crackleback. Pam just went along for the ride and to take pictures. 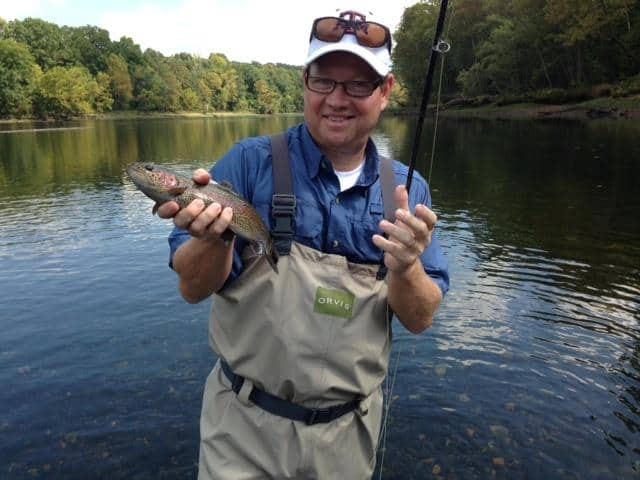 Tim, from Texas spent the morning on the water with Darrell. 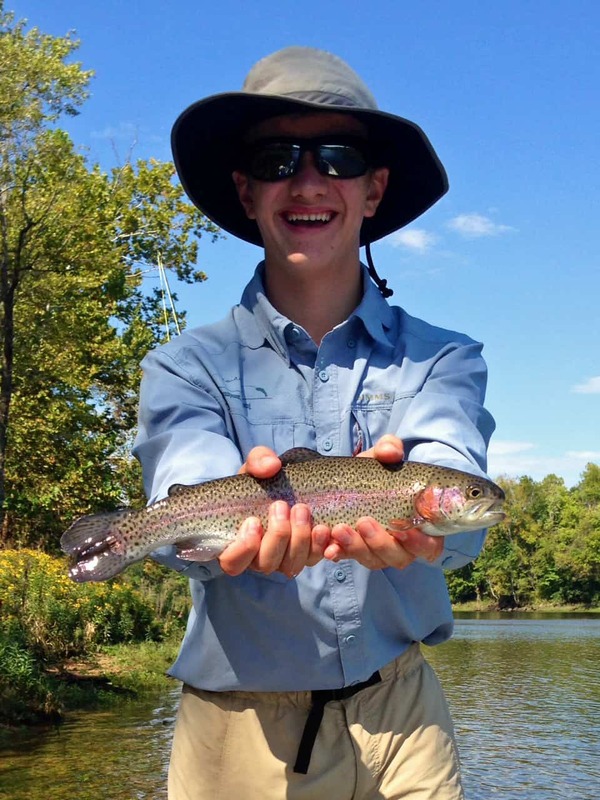 Really fun day for Tim as he has not been fishing for some time. They caught on the black copperhead midge and a San Juan worm. September 30, Dana had Roger from Illinois out for half a day. Good day for Roger on a micro fly, copperhead black midge and white grub. One of our regulars from Kansas, Mike was out with Stan. Some quality fish on the the white grub. Finally made it to October! Last Wednesday, Darrell took Dennis and Eric out for half a day. Kind of slow this day, but they did boat some fish on the P&P midge. Carolyn was on the water on an instructional trip with Danny and Melinda from Texas. Fun day and fun couple. We worked on everything, including catching fish. It was the black tunghead midge, P&P, and holographic green crackleback. Last Thursday, Dana took Tony and John from California out all day. Tough day. Tony’s first time stripping and caught a nice rainbow on the gold varient sculpin. Bill, from Colorado, spent half a day on the water with Stan last Friday. Not a barn burner day, but pretty good. 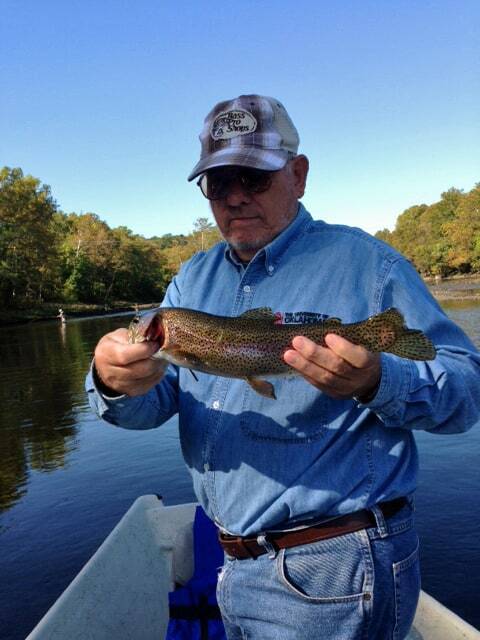 Bill’s best fish was a 17-1/4″ rainbow caught on the black copperhead midge under the big ruby. One unit was running then they put in. Carolyn had Lyle and Joan on the water Monday. 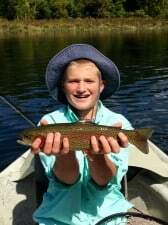 Their son had fished with us before and bought them a guide trip and night’s stay in one of our cabins. 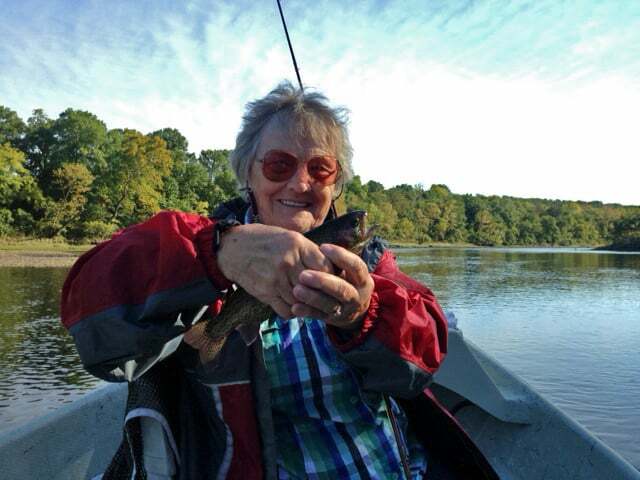 This was Joan’s first time with a fly rod. Not sure who caught the most, but we fished the black copperhead midge, JQ streamer and holographic green crackleback and had a lot of fun. 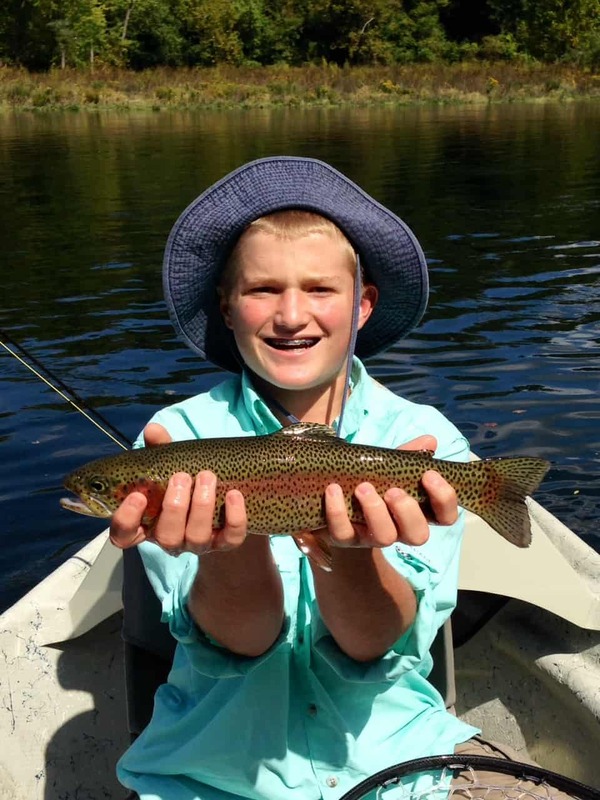 This entry was posted on Thursday, October 9th, 2014 at 1:40 pm	and is filed under Fishing Reports. You can follow any responses to this entry through the RSS 2.0 feed. You can leave a response, or trackback from your own site.